The name tangerine comes from Tangier, Morocco which is the port from which tangerines were first shipped to Europe. Tangerines are the common name for a variety of Mandarin oranges. Mandarin oranges are native to southeastern Asia and they are widely cultivated in orange-growing regions of the world. 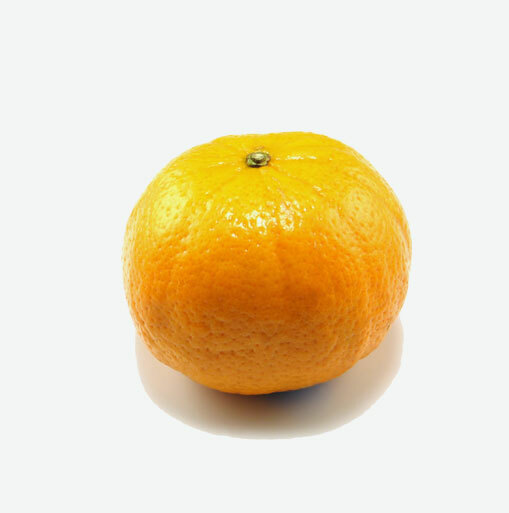 Tangerines are smaller than oranges and oblate in shape, with an easy-to-peel skin. They have a pungent aroma, a thinner rind and the sections can be easily separated. Tangerines are more delicate than oranges and need to be handled with care. Tangerines have similar health benefits that oranges provide. They are an excellent source of vitamin C. Tangerines also provide a good source of fiber, B vitamins (including vitamins B1, B2, and B6, folic acid, and pantothenic acid), carotenes, pectin, potassium, and folic acid. Eating tangerines are beneficial for the immune system, the lens of the eye and the adrenal glands. They are also good for promoting overall good health. Select tangerines that feel heavy for their size. This means that they are full of juice. They should be firm and plump, fill their skins and not feel hollow. The skin should be shiny with a strong orange coluor. Avoid fruits with blemishes, wrinkles, mold, and signs of damage or decay. A sweet tangerine actually smells sweet. Tangerines need to be stored in a cool (not cold) place. Cold temperatures will damage the fruit. If the tangerines are placed in a plastic bag, punch small holes in the bag to avoid the condensation which could damage the fruit. Fresh tangerines are delicious when eaten fresh. Just peel them and enjoy. These fruits are pretty versatile and can be added to fruit salads, made into fruit kabobs, added to cakes and quick breads. Try adding tangerine segments to chicken stir fries or freezing them whole and peeled later for a cold treat on a hot day.